Last weekend my wife and I, along with some friends, drove around 450 km to visit a Cheese Festival (Festiqueijo) in the town of “Carlos Barbosa“, in a region colonized by Italians. 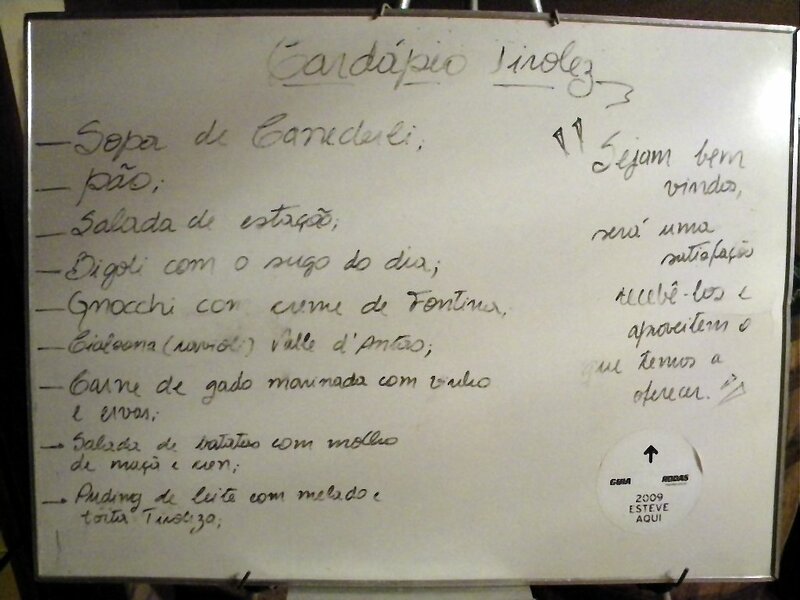 Our hotel was in “Bento Gonçalves“, the wine capital of Brazil, colonized by immigrants coming mostly from the Italian regions of Veneto and Trentino. Looking for places to have a nice Italian dinner the restaurant “Pignatela” (no telephone, no e-mail, no web site) was recommended, and there we went on that rainy and cold night (don’t forget it’s winter here). For those who may have the opportunity to visit the area, the restaurant is located right at the beginning of the road that gives access to one of the largest wine houses of the region, “Vinícola Salton” (everyone in town knows the place), on the right side. The place doesn´t look or feel very comfortable, and in fact it is not, but we were greeted on the door by the owner with a smile that warmed up our bones and just made we want to get in and have our meal . The owner (born in the Veneto) has a grape plantation and a small grape juice factory, but decided to establish this small restaurant in his own house to help spreading the Italian culture a bit more. 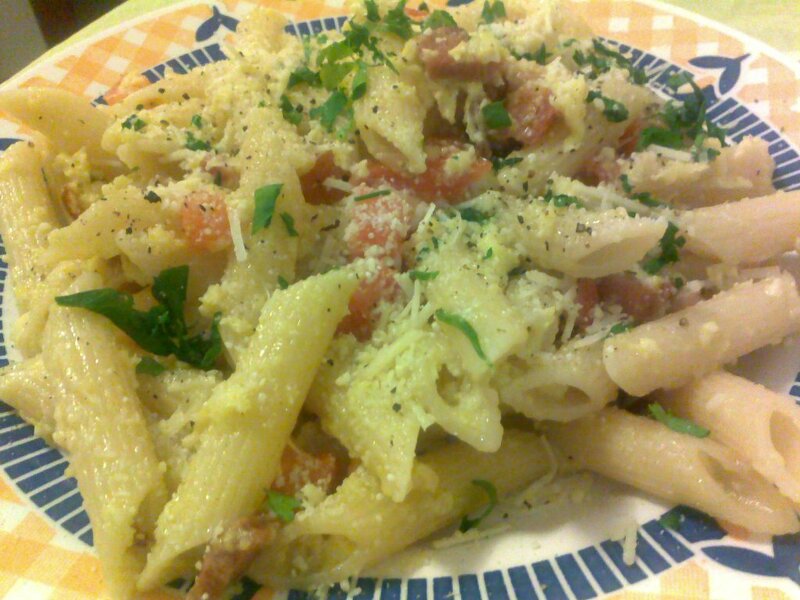 Since the region has already dozens of restaurants serving all kinds of pasta, pizzas and the usual stuff labeled as “Italian”, his decision was to explore the culinary of the Trentino-Alto Ádige, also known as Trentino Südtirol, and serve typical tirolese dishes, something not easily found (at least in Brazil). Glad that no decision concerning the meal was necessary, as they only have one complete menu, displayed on a board right at the entrance door. As you can see the first dish was a Canederli soup. 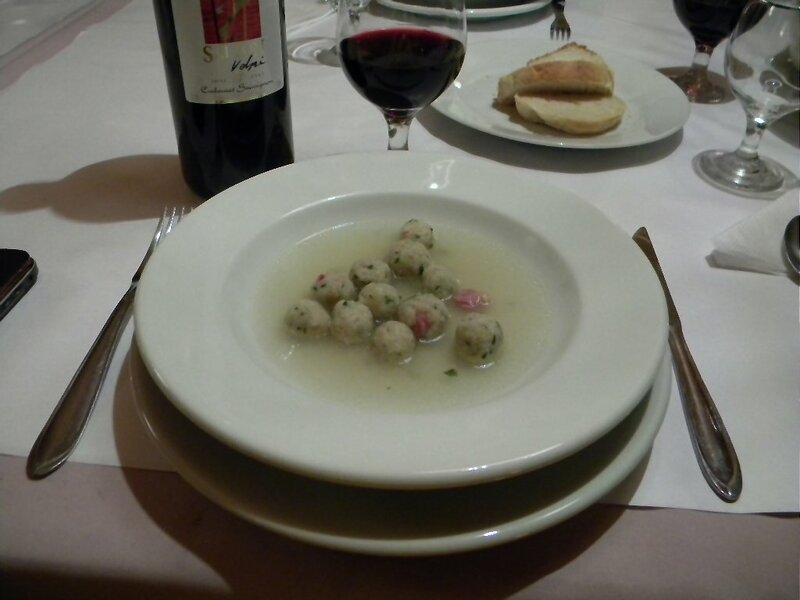 Canederli are small balls prepared mainly with bread, milk, eggs, some bacon and spices cooked in a chicken broth. This “primo piatto” was served with home-made bread. The wine? A Salton Cabernet Sauvignon (maybe not the best choice to go with these Tirolese dishes, but the best one available). 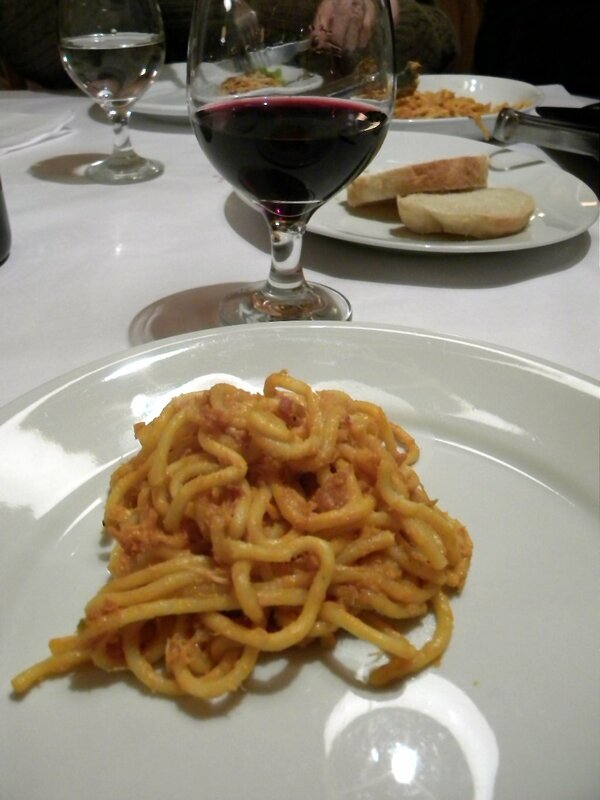 Then follows “Bigoli al sugo”, a long pasta tube, similar to the bucatini, served with a chicken stew. To be completely honest, the pasta was way overcooked and the sauce tasteless. You won’t miss anything if you just let this one pass and save your stomach to the next one, a gnocchi con creme de Fontina. This was, in my opinion, the best dish. 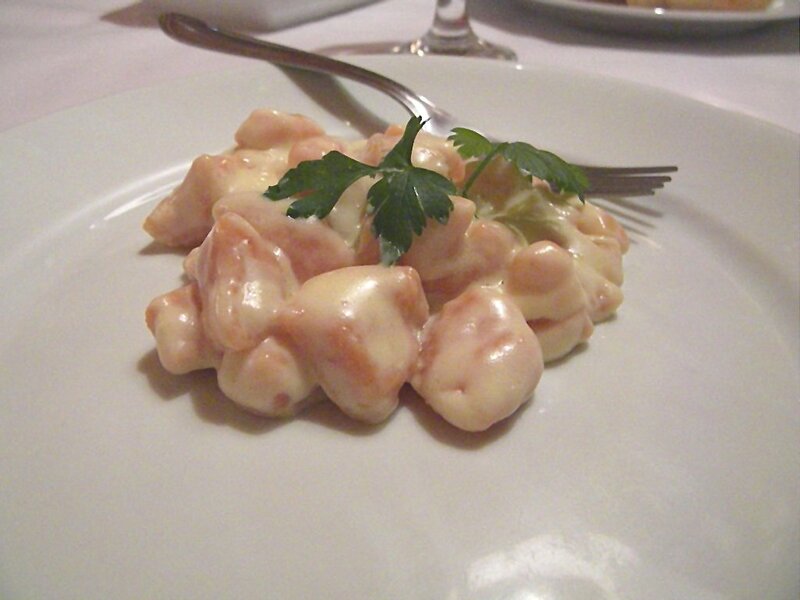 The gnocchi was made with tomato, what gave it quite distinctive color and taste. Fontina is a cheese prepared from unpasteurized milk, with a wonderful earthy taste. It melts well and forms a nice cream specially due to its relatively high fat content (around 45-50%). 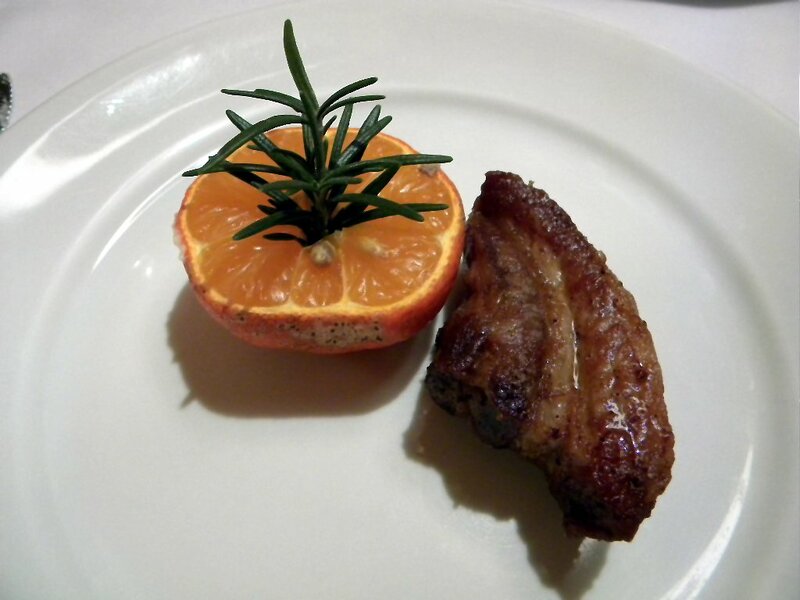 This wonderful pork, marinated in white wine with some Italian lemon was not even on the menu. A nice surprise. 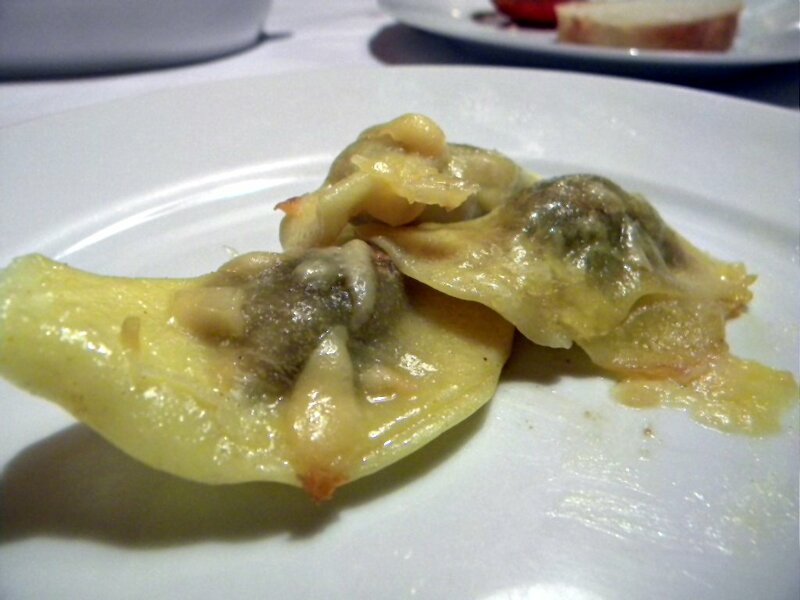 These ravioli (I know, the photo looks terrible as the dish was cold when it was taken – I’m trying to improve) had a most wonderful filling. The owner defies you to figure out the main ingredients. Some are quite easy to discover, but a few of them are just unbelievable. I won’t tell you as I don’t want to spoil the surprise (guess you’ll have to come to go to Bento Gonçalves). 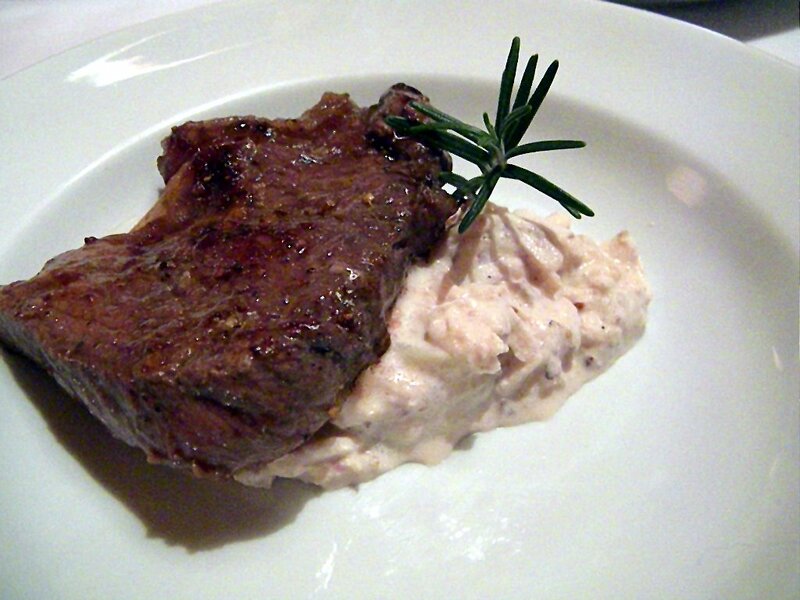 Another protein follows: steak marinated in wine and herbs served with a potato, apple and horseradish salad. Maybe this was the best dish? Oh Lord, I just can’t make up my mind. Guess I’ll have to start all over again. Please, bring me the Canederli. Dessert. Of course! 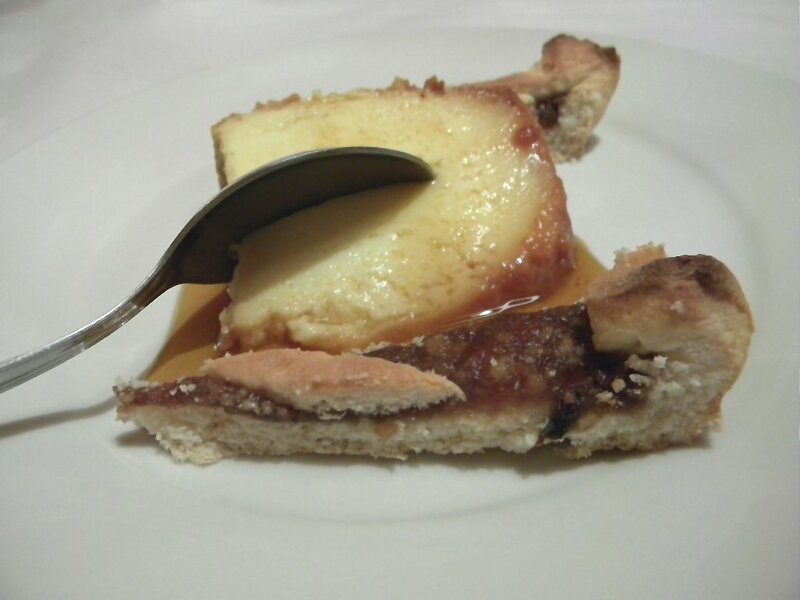 A milk custard (flan) with mollasses and tirolese (apple jam) pie. Clearly the New World has its finger here, as I bet they don’t grow sugar cane in Südtirol. What a nice meal. The price? About US$ 20,00/person, including wine. If I happen to be around, be sure I’ll visit the Pignatela again. Today, and for the next 3 days, my youngest daughter (Joana) is going through several examinations, along with 32,000 other candidates, for a spot in one of the largest Brazilian Universities, the Federal University of Rio Grande do Sul, in Porto Alegre, the capital of our state, as she plans to study Computer Engineering. Today she had exams on Brazilian Literature, English and Physics, from 8:30 to 11:30 a.m., and the temperature was reaching 95oF. No need to say she left the exams pretty exhausted; and has to go through additional ones for the next 3 days, as I’ve already mentioned. We ate something fast for lunch, but I figured she would need something more substantial in terms of energy for dinner. Something like a pasta (full of carbohydrates, fast energy for the brain) with some fat (some lipids for slow burning metabolic processes). 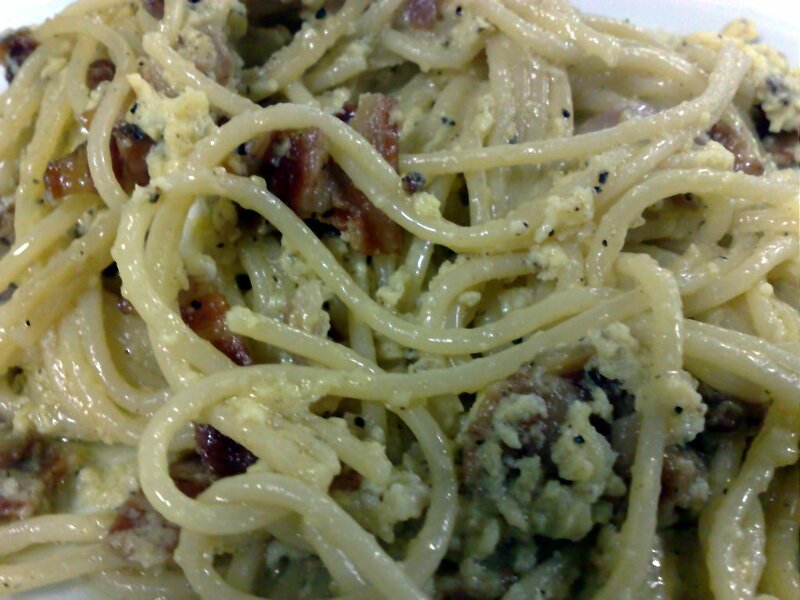 Made a search on Foodista and decide to go for the Spaghetti Alla Carbonara. The result you can see below. You sure have noticed I used penni rigatti instead of spaghetti (I didn’t have any). I have to say that, although I didn’t have an Italian pancetta, the result was rather similar to the dish we had in Italy last summer. We stopped at a roadside trucker joint between Assisi and Rome, and they served the best spaghetti alla carbonara I’ve ever had. I believe the secret was the pancetta, fantastically flavorful. Another post related to Florianópolis, but that’s only because I’ve just spent the last weekend there (and it was an extended one, since September, 7th is a holiday – Independence Day). The shellfish were cooked on a garlic, onion, tomato base to which some chopped scallion and parsley were added. Pasta was boiled until “al dente” and the shellfish generously placed on top. Simple to prepare and delicious, after all you don’t need much with fresh sea food. One extra kick though – red pepper. Peppers of the genus Capsicum, even though spread all over the world, and an integral part of the so called “traditional” cooking of several countries (like Thailand, for example), originated in fact from the tropical areas of Latin America. Another Latin contribution to the world cooking during the first globalization wave, which occurred after the discovery of the Americas. They belong to the family Solenaceae, along with tomatoes and potatoes, which, not by chance, are also of Latin American origin. There are several species and varieties of peppers, with different shapes, colors and degrees of burning potential. In Brazil, they were the main seasoning agent employed by the native population before the arrival of the Portuguese colonizers. Among the most known and cultivated species is Capsicum baccatum, around here called ladies’ finger. The burning sensation of a pepper is given by the presence of capsaicin, which is usually evaluated using the so-called Scoville scale. C. baccatum has na Scoville index between 30,000-50,000, just like the Tabasco pepper, not very high if you consider that a Naga Jolokia can have an index of 1,000,000. In Brazil such peppers are usually prepared by macerating (or finely chopping) a couple of them, which are then left to mature for a few weeks in olive oil. A flavoring agent, like garlic or rosemary, may be added. Whole peppers may also be present, both for flavor as well as for decoration. A few drops of this mixture over your seafood dish will bring up a whole new dimension. But be careful, one or two extra drops and you may literally spoil your dish. Just in case, keep a bucket of cold water, or of beer, or of white wine, or of whatever you like to use to extinguish a fire, around. Today is the Brazilian equivalent to Valentine’s Day (Lover’s Day would be a more adequate translation). My wife, who happens to be a terrific cook, waited for me at lunch time with fresh spinach fettuccini topped with filet mignon in Madeira sauce. Yeh, good Lover’s Day for you too. My Lover’s Day advice: Do you want to hook up with a man? It’s just like fishing, use a good bait.